The Shawn Kelley era was officially closed in Seattle today when the Mariners traded the relief pitcher to the New York Yankees for minor league outfielder Abraham Almonte. Kelley had been designated for assignment last week. The Dominican-born Almonte, 23, was not a top Yankees prospect by any means but does play all three outfield positions and that’s an area where Seattle lacks depth in the upper minors. Almonte reached Class AA last season and split his time fairly evenly between all three outfield spots. When you look at the Mariners right now, there aren’t many guys who can play center if needed who aren’t already at the major league level, so yes, this can be considered a depth move. Franklin Gutierrez could be gone in a year and after that, you have Michael Saunders and Casper Wells and not a whole lot on the center field radar in the organization after that. No one is comparing Almonte to Torii Hunter in his prime, but you do need guys who can play something other than the corners at all levels of an organization. The move also saves the Mariners nearly a million bucks, since Kelley was set to earn $935,000 while Almonte makes five figures. Also, Kelley just no longer fit in Seattle, having been passed on the depth chart by numerous others. The fact the Mariners traded him even though they lack experience from the right side — as evidenced by their signing of Kameron Loe yesterday to a minor league deal and camp invite — spoke volumes about where the current regime saw his future here. 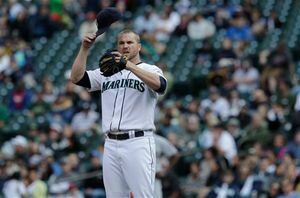 Kelley broke in with the Mariners in 2009 and was the longest-serving member of Seattle’s relief corps before this deal was made.